Cois Cladaigh launched its first cd “Lux Aeterna” in September 2000 which was recorded in St. Mary’s Church, Tuam, Co. Galway and in November 2008, launched 3 cds called “An Equal Music” recorded in Ballintubber Abbey, Co. Mayo, “Beatus Vir”, a live recording of a concert in St. Fin Barre’s, Cork and this cd which is a selection of Christmas music recorded in St. Nicholas’ Collegiate Church in Galway. Cois Cladaigh has developed a special relationship with St. Nicholas’ Church – it has performed most of its concerts there and also uses the church for visiting choirs to give their recitals. Its varied spaces, acoustic characteristics and the organ make it a wonderful venue for choral concerts. 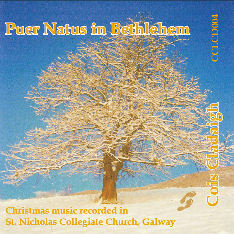 To order a Puer Natus CD please click here. Possibly from a 14th century Benedictine processional from the monastery of St. Georg, Hradlisch, near Olmütz in the Czech Republic. Stans onerata nobili onere Maria, et matrem se laetam cognoscit quae se nescit uxorem. Et benedicta in aeternum Deum nobis protulit et hominem. Chant 2.Gloria Patri et Filio et Spiritui Sancto. Riu, riu, chiu translates as God, keep the wolf away from our sheep. Some also suggest it might be taken to mean God, keep the devil away from our souls. Music in the early Renaissance was rich in the Christmas theme and this rhythmically exciting piece is one such example. Omnes de Saba venient, aurum et thus deferentes et laudem Domino annuntiantes. Alleluia. Reges Tharsis et insulae munera offerent. Reges Arabum et Saba dona adducent. Alleluia. Lassus was a hugely prolific composer and wrote in many different styles. This setting for double choir shows off his polyphonic style with the 2 choirs sometimes singing as 8 voices or in statement and response mode. An uplifting “Alleluia” brings this piece to a close. The Christmas story as told in Irish and sung by Cois Cladaigh’s women. This is a lullaby from a mother to her dear child. McAuliffe wrote both the music and the text for this 3 verse piece which tells the story of Christ’s birth from the Virgin Mary’s perspective as she gently rocks her new born baby to sleep. The Fader of Heven, God omnipotent that sett alle on seven, His Son has He sent. My name couthe he neven and light or he went, I conceived hym full; even thrugh might as he ment. Telle furth as ye go, And myn on this morn. The poet describes how candles will be lit in houses on an island (Inishmór) on the west coast of Ireland to celebrate Christmas. Except for a few notes, Judge has set the words to music with a strongly traditional feel to it. This recording was made at the 47th Cork International Choral Festival. As for Videte miraculum, Tallis interjects 5-part-writing with plainchant. Daley’s writing style is very accessible and in this setting of the well known text, she demonstrates her skills in using different groupings of voices for each verse resulting in an exultant overall effect. Little star of Bethlehem, do we see thee now do we see thee shining o’er the tall trees? Little Child of Bethlehem do we hear thee in our hearts? From His Father’s home on high lo! For us He came to die. Hear the angels sing:“Venite adoremus Dominum”. Ives who is best known for his experimental music, shows the more traditional and melodic side to his compositional skills. This piece bursts with joy and you can hear the long reverberation of St. Nicholas’ acoustic at the end of this piece. Pueri concinite, nato Regi psallite, voce pia dicite, apparuit, quem genuit Maria. Hodie apparuit in Israel, ex Maria Virgine, natus est Rex. Alleluia. Von Herbeck sets the text for soloist with accompaniment. This text is then repeated by 4 part choir with the soloist on descant. A traditional Scandinavian melody set for solo voice and 4 part choir. Set for 8 part choir, the text sets the music content of this short piece. Jennings set these snippets of 6 different Christmas spirituals for the virtuoso U.S. male voice ensemble Chanticleer.